Kevin King and Olivier Bédard are winners after an action-packed day! The 2016 Nissan Micra Cup held its fifth and sixth races of the season today at the Autodrome St-Eustache, near Montreal. For the first and only time this season, the drivers competed in two races and qualifying sessions on the same day. This format was a successful one for Kevin King and Olivier Bédard, both of whom won a race. The first race of the day saw lot of action, during which Kevin King, Olivier Bédard and Stefan Rzadzinski established a significant lead in front of the rest of the drivers. A black flag penalty of a few seconds caused Rzadzinksi to fall behind and Marc-Antoine Demers climbed to third place, earning a position on the podium beside his teammate Olivier Bédard (2nd) and Kevin King (1st). Although King led the entire first race, the pressure was on with the presence of Bédard at his back the whole time. Several great battles took place on the track, including Bertrand Godin who proved he has not lost his touch after finishing ninth in his first ever Nissan Micra Cup race. He fought with the young Chris Sahakian, as well as with veteran Jacques Bélanger. The final race had similarities and differences from the first. The same three drivers who had qualified in first, second and third place for the first race, started in the same positions for the second race. Kevin King started in pole position, followed by Olivier Bédard and Stefan Rzadzinski. It is only at the end of an action-packed event that Bédard was able to win his first race of the season, only one corner away from the start/finish line! Aside from the King-Bédard battle, Xavier Coupal gave a hard time to Stefan Rzadzinski who had to give away his third position to the NASCAR driver. Coupal only drove during the second race, sharing the wheel of his car with Bertrand Godin. In the drivers’ championship, Kevin King clinched the lead with 170 points, ahead of Xavier Coupal (168 points), Stefan Rzadzinski (163 points), Valérie Limoges (152 points), Olivier Bédard (143 points) and Marc-Antoine Demers (115 points). For the rookies, Peter Dyck is now leading with 36 points. In the Team standings, Albi Nissan car #572 driven at the first events by Xavier Coupal and today in St-Eustache by Bertrand Godin remains on top, followed by car #86 (Perry Performance/Hull Nissan) and #220 (TOTAL Canada). 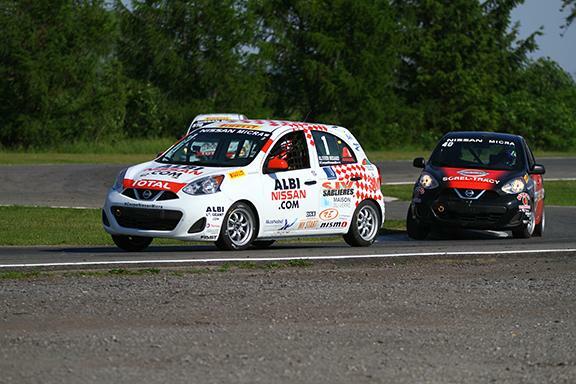 Following this event at the Autodrome St-Eustache, the next outing for the Nissan Micra Cup will be on July 8, 9 and 10 in Ontario. The seventh and eighth rounds of the season will be held at the Canadian Tire Motorsport Park, in Bowmanville, during the famous IMSA SportsCar Weekend. This marks the first race weekend at this legendary racetrack, formerly known as Mosport, for the Nissan Micra Cup.